I received free product from Delta Faucet Company to write this post, but all opinions expressed are my own. I hope you all had a great holiday week last week. We had firework shows nonstop on the lake for 4 nights in a row. The best part was we had the perfect view out our master bedroom windows, so the whole family snuggled in our bed to watch. Several of us only made it through the first 5 minutes before snoring, (cough, cough, the boys), but it was so fun. I had a few minutes to snap photos this morning of my daughter’s bathroom, which I haven’t really shared much of yet. If you remember last fall I bought this beautiful old dresser from the Allegan Flea Market and it jumpstarted my whole design plan for this room. I wanted a soft vintage vibe for this room, but not too girly because this is also the main bathroom for people hanging out in the basement to use. They guys did an amazing job reworking the inside of the dresser to accommodate the plumbing. It was originally white, but my daughter begged me to paint it a fun color. I was going for a more subdued blue, but she talked me into this fun Denim color (which is actually called Denim!). I painted it with an outdoor quality paint to help repel water. I found this pretty floral wallpaper at Anthropologie and I liked how it kind of went with the curved lines of the dresser. This would have been a little dizzying floor to ceiling in such a small space, so we decided to just do 3 of the walls. I also had the guys do a board and batten treatment (shocking I know) on the lower half of the bathroom to disguise the foundation wall by the window. It created this nice shelf wall under the window, which I’m still figuring out decor wise. I had some cute orchids lining the window sill, but it turns out my daughter was watering them every day unbeknownst to me. They sort of drowned in her “loving care” kind of like the goldfish she hugged too tight when she was 2 :) I just borrowed this faux one from my mom’s house for now while I figure it out. 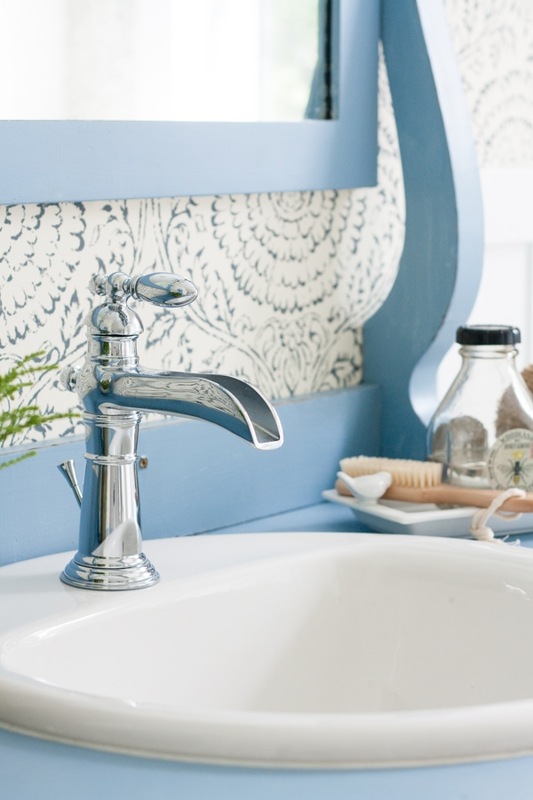 I chose this beautiful Victorian Single Handle Lavatory Faucet from Delta for this bathroom. 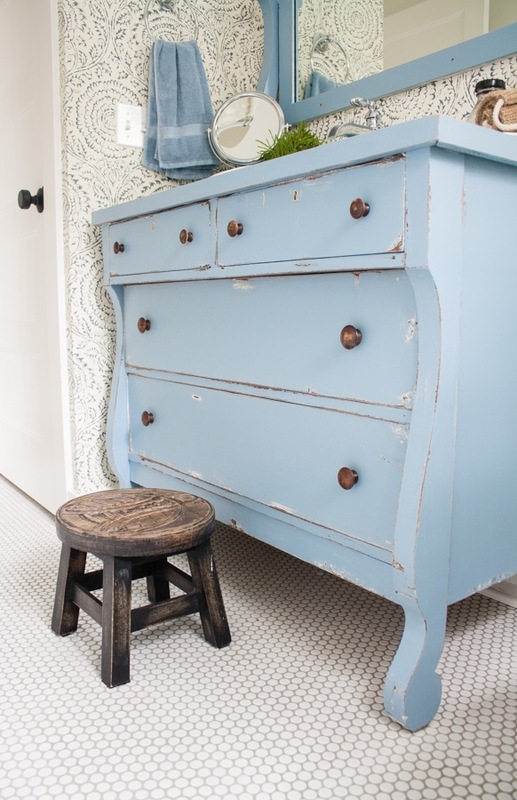 I loved the vintage feeling of it and it looks like it was meant to be in this old dresser. I love the contrast of the Chrome finish with the oil rubbed bronze light fixtures and towel hooks. This Universal Showering In2ition H2Okinetic 5-Setting Two-in-One Shower Head in Chrome was another great pick for us. It has been a life saver for my daughter’s hair. She always has a hard time getting shampoo and conditioner out of her hair because she is petite. With this shower head, she can detach the head and rinse her hair easily – it’s been so great! I found this adorable shower curtain at Urban Outfitters, and it’s like your grandma’s old bedspread in the best possible way. I don’t know about your kids, but mine seem to be lacking the ability to hang towels on on an actual towel bar. But give them a cute hook and they have it down (at least 50% of the time). I found these cute hooks with my daughter’s initials at Anthropologie and the guys attached them to a board for me to make it extra sturdy. We used penny tiles on the floors in here, which I love and they feel so good under your feet. This is long skinny bathroom to photograph, so stop by my Instagram later today because I will be doing an instastory tour and you will get a better feel for the space. If you don’t follow me on Instagram, I typically do a little story over there on post days of whatever space I posted – it’s a fun way to get a little video tour! Absolutely perfect!! I wish I had your talent to be able to visualize and then pull it all together to create such a beautiful bath!! Thanks Laura, it was a fun room to design! 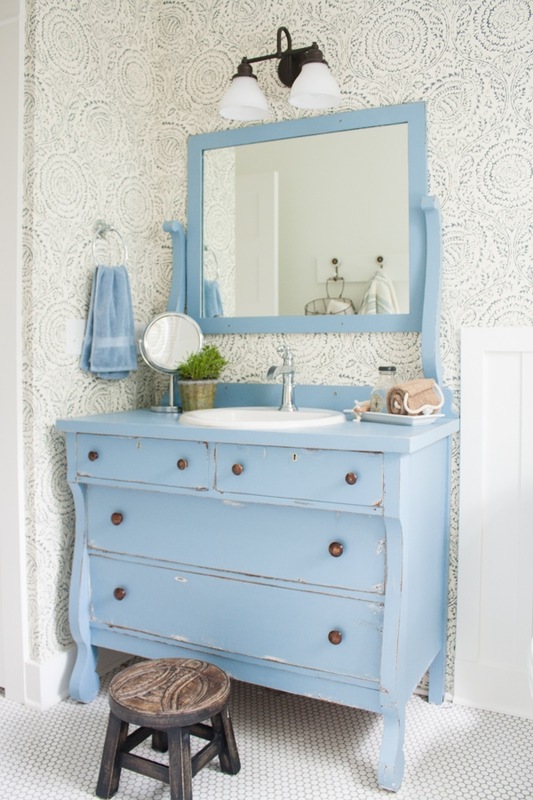 Your daughter must love her bright bathroom, I love all the details and the color on the dresser and the aged finish. It looks perfect with the dreamy wallpaper!!! It all looks beautiful. looks amazing kelly. is the color of the wall paper blue or gray? Im thinking it is blue but wanted to double check. The wallpaper comes in blue and gray I believe but this is the blue version. Thanks! Love this bathroom! 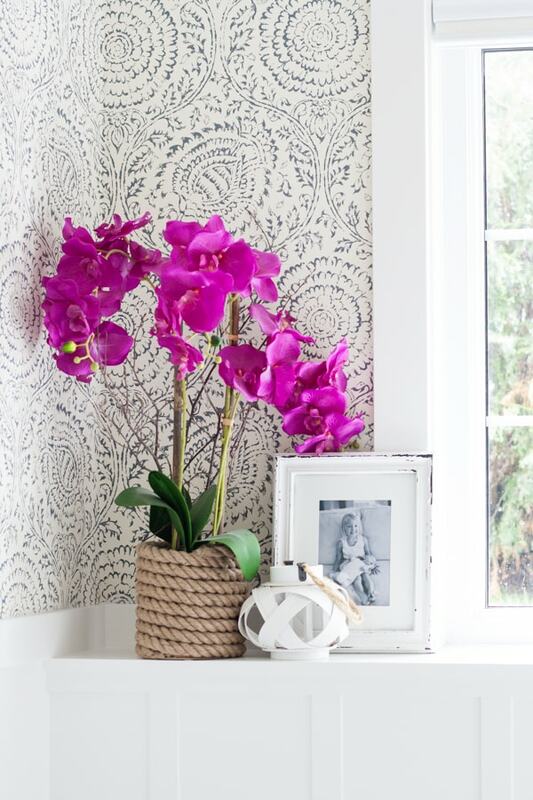 I have always been a fan of wallpaper (and denim) and this gives off the right vibe of “nice” and casual for our lifestyle. 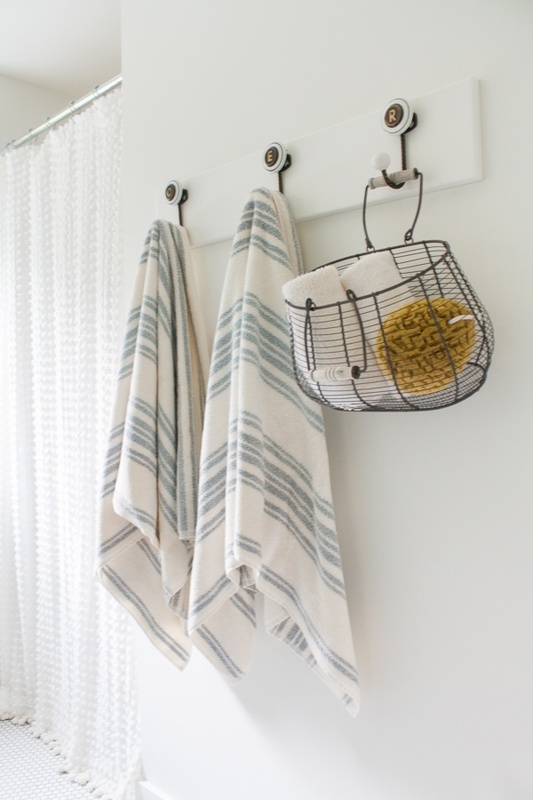 I started using hooks in the bathroom when my kids were young (in their 20s niece and out of the nest). 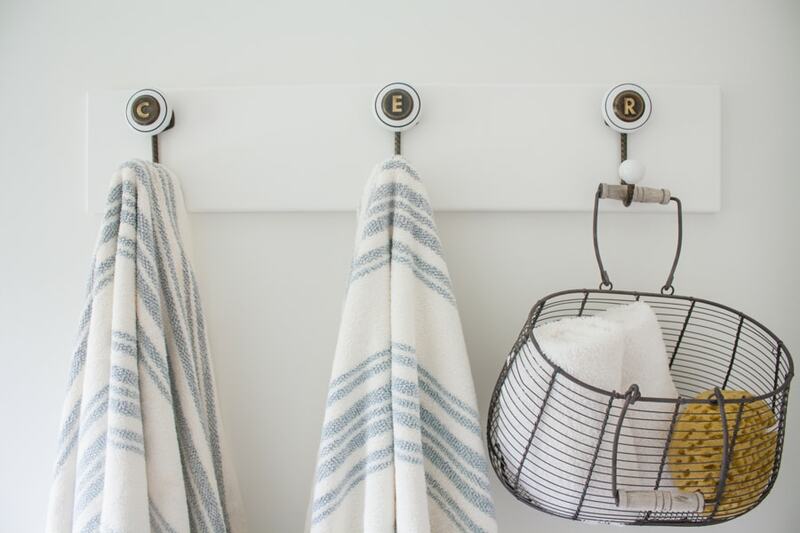 We remodeled both upstairs bathrooms this year and put towel hooks in both – so easy and the compliments we get on them never stop! Yes hooks are definitely the way to go! Beautiful bath! I have two nearly identical dressers in my, ahem, storage area, and they’re both likely to be vanities in our next home. 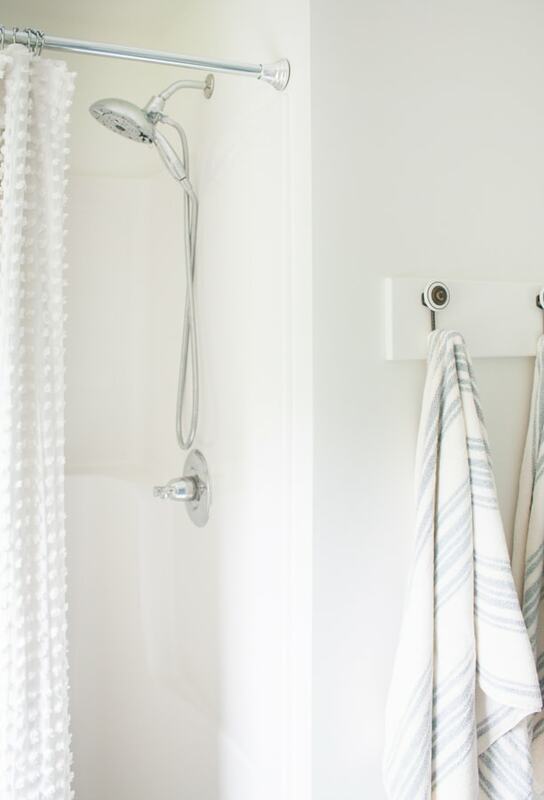 Yours is lovely and the faucet…the wallpaper…the shower curtain…the towel hooks…wow, you are a master at choosing accessories! Thanks Dori! OH jealous you have two dressers that sounds like it will be amazing! Love the bath. The dresser/vanity turned out great. 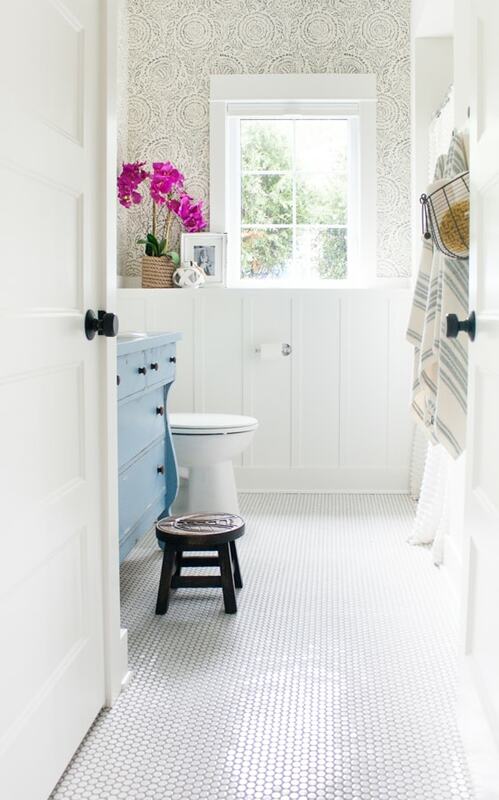 Love, love, love this bathroom! 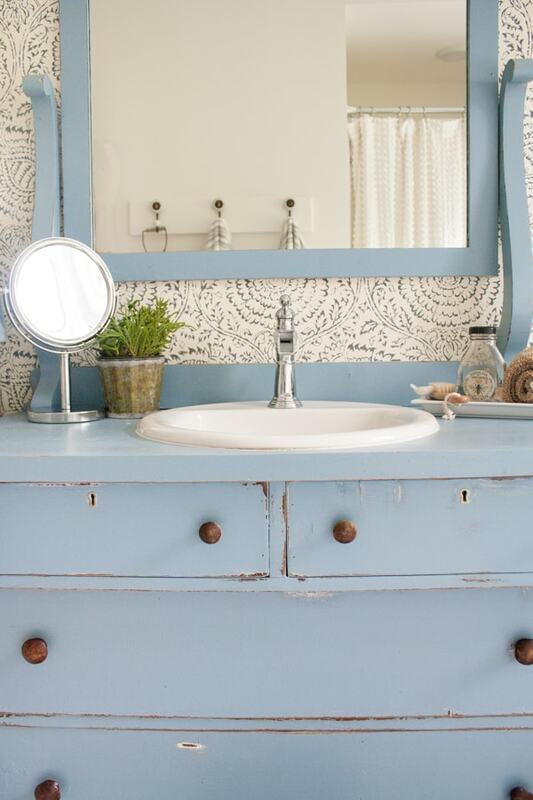 I’ve always wanted to repurpose a dresser into a vanity. You give me courage to do so. It looks great! Just one question, I’m curious as to why you didn’t continue the board and batten behind the vanity? Does it interfere with the plumbing? 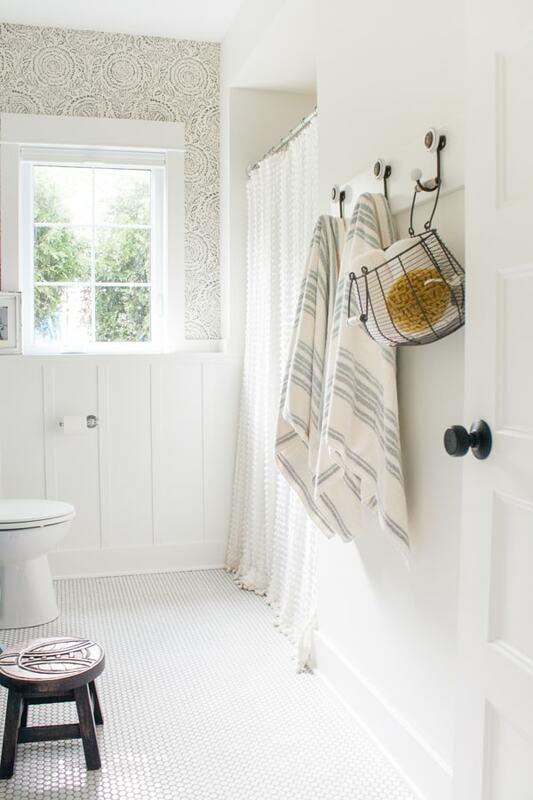 I love that look in bathrooms and was planning to create that look in my bath renovation. We couldn’t figure out a way to do it where the dresser could still be flush to the wall for the plumbing. It looked really weird when we had it end into the countertop and it also goofed up the mirror. This was kind of the only way it worked. Oh, I simply love all that you’ve done. I’ve told you that I thought you were crazy to leave that last house but what do I know? I’m decor challenged. I’m the type of person who paints things once and thinks it should last a lifetime — I know boring. When I begin to think of picking paint colors I break out in a sweat!! Pathetic, I know!! You’ve done such a marvelous job of putting everything together. Can’t wait to see the next installment. Thanks Maria, paint colors make me nervous too lol! Gorgeous! But I expected nothing less! Your house is AMAZING! Beautiful! 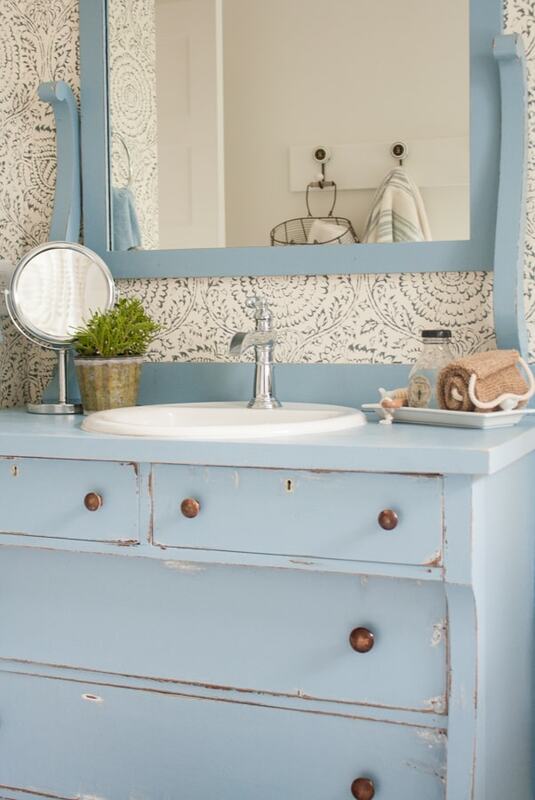 I absolutely love the dresser/sink and the wallpaper. I am curious though, why you didn’t extend the board and batten behind the dresser? This room has a very comfortable/cozy but very fresh and airy feeling to it. Love it! Love this bathroom!! Looks amazing! Great job on this bathroom! I love the color on the dresser! When I looked it up on Pinterest it showed SW Denim to be a much darker color. Did you lighten it up or is the picture brightened? Looks so pretty,Kelly! I bet your daughter has fun with that cool faucet! We are doing this exact idea right now, but I chose a square sink that sits on top. Rick had enough of messing with the previous hole and we gave up. If anyone ever looks under the sink they will get a good laugh 😂 Can’t wait to see more! Sweet & sophisticated! 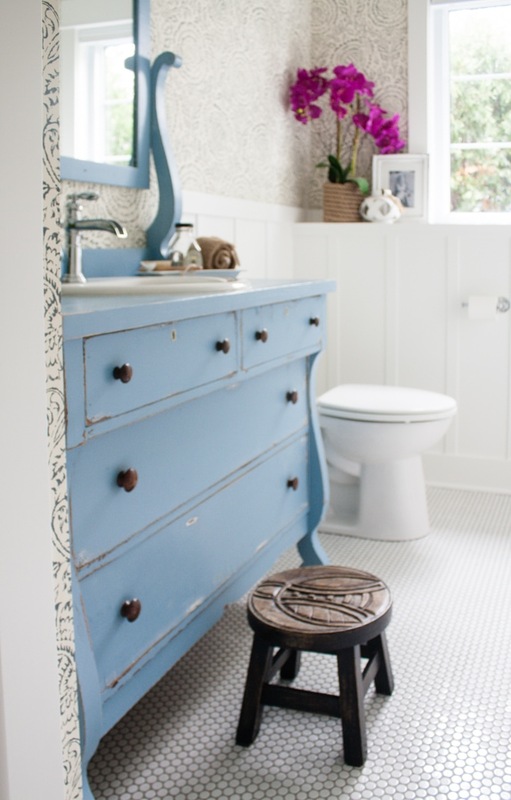 Love how the sink/light fixture and wooden stool tie together. Adorable shower curtain. Girly girl with a grown up flair. Looks beautiful. I love the plaid trend, even though I haven’t decorated with it before. That pic of bedroom is priceless. You have such great style… I love every single detail! Curious about the wallpaper for a room this size- do you remember how many rolls you needed? Your daughter’s bathroom is adorable, really love the wallpaper on the top half of the wall. I was at Kirkland’s on Alpine Ave today and saw the cutest wood blue whale that would look so cute on her window ledge. I love seeing all your rooms…such a beautiful home. Love this space! Beautiful design. Curious what color grout you used on the floor! Thanks! It’s a medium grey I don’t know the name sorry! What a great idea! The dresser looks great, but are you still able to use the drawers? Or did you have to screw them shut to fit the plumbing fixtures? The top drawers are no longer useable but the bottom two are, they just cut the middle section out. I love that the wall is extended under the window! May I ask how this was accomplished (what to put into our plan to acheive this look). Was this a costly change? It adds a lot of texture to the bathroom. Lucky and charming outcome! Thanks! How is the tile holding up? Did you just use white penny tile on sheets from Lowe’s? Grout color? So far so good :) yes the sheet from lowes are what we used. Not sure on the grout color it’s a medium gray!